A video showing a UC Berkeley bicycle officer citing a bacon hot dog vendor on campus and removing cash from his wallet for operating without a permit has gone viral. 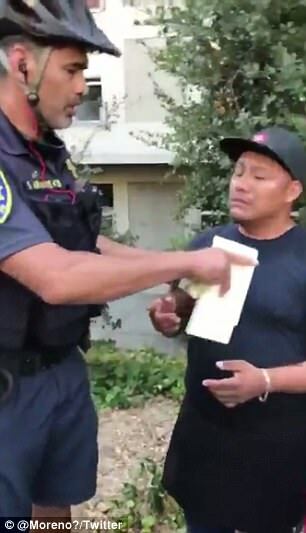 In the video, taken by alumnus Martin Flores on Saturday afternoon, a UCPD officer is seen pulling cash out of the vendor’s wallet and folding it into his hand. The vendor objects and stands by as the officer puts the money away and begins to write a citation. In a statement released Monday, UC Berkeley Vice Chancellor Scott Biddy said vendors typically are given warnings before a citation and explained what prompted the officer to intervene. Flores said that he was buying hot dogs from the vendor for his kids after Cal’s game against Weber State when the officer interrupted them to cite the vendor. The officer asked for the vendor’s ID and as the man fumbled through his wallet, the officer took it out of the vendor’s hand, Flores said. “That’s when I thought something was not right,” Flores said. So he pulled out his phone and began to record. In the first moments of the video, the officer is seen pulling bills from the man’s wallet and folding them into his hand. Flores repeatedly says, “That’s not right,” and asks the officer why he’s taking the vendor’s “hard-earned money.” Flores claims that people were drinking in public not that far away, and that officers should have targeted them instead. University officials said Monday that the officer took $60 from the vendor. Three others outside the game were given warnings but not cited, officials said. In a phone interview Monday, Flores said he understood that the vendor needed a permit so the officer wasn’t technically wrong in issuing a citation. It simply appeared the officer’s enforcement was selective. Flores’ video has been viewed more than 11.4 million times since it was posted Saturday onto his Facebook page. He said he felt disappointed as he posted the video online. A petition to have the officer fired has received more than 11,000 signatures. Flores launched a GoFundMe effort for the vendor, identified only as Juan, with a $10,000 goal. It had raised nearly $33,000 as of Monday morning. The money will go to cover the vendor’s legal expenses and personal losses, Flores said. The rest will go to a broader effort to help vendors in the area, he said. He will not take any of the money that’s donated for himself, he said.